First line: "There was only orange juice in the fridge." 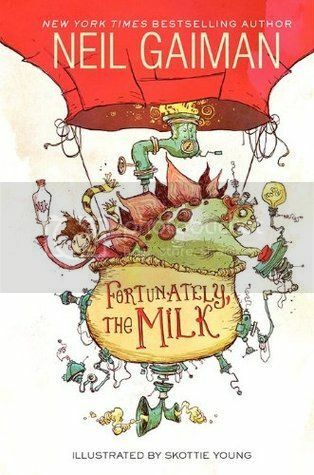 Fortunately, the Milk is a fast-paced, silly tale of a father determined to bring milk home to his family - despite alien attacks, time travel, super cute ponies, inept pirates, bloodthirsty piranhas and more. One random, unbelievable thing after another keeps happening, turning Dad's quick jaunt to the corner store for a bit of milk into a major ordeal. Gaiman deftly keeps the the story moving at a zany pace while managing to shoehorn in many highly wacky non-sequiturs, making each surprising new twist in the story look effortless. As the beleaguered father's story grows more and more unbelievable, his son and daughter begin to grow quite skeptical of his grandiose claims. Kudos to illustrator Skottie Young for subtly including all the (possibly inspirational?) elements from their father's crazy story into the family's typically British home. I'll recommend this to kids who want a fast, fun read.